"Hugo Chavez abused the privilege that he had speaking at the U.N. In doing so, in the manner which he characterized the president, he demeaned himself and he demeaned Venezuela. Hugo Chavez fancies himself as a modern day Simon Bolivar, but all he is an everyday thug." "You do not come into my country, my congressional district, and you do not condemn my president. If there is any criticism of President Bush, it should be restricted to Americans, whether they voted for him or not. I just want to make it abundantly clear to Hugo Chavez or any other president, do not come to the United States and think because we have problems with our president that any foreigner can come to our country and not think that Americans do not feel offended when you offend our Chief of State." "Let me put it this way, I can understand the frustration, ah, and the anger of certain people around the world because of George Bush's policies... We tend to forget that a few days after 9-1-1 thousands, thousands of Iranians marched in a candlelight procession in Teheran in support of the United States. Every Muslim country was basically on our side. Just think, in five years, President Bush has squandered all that." Thanks for nothing, Tom Harkin. I like that a lot better. Still, it's a pity when people need to be reminded of such things. There are many reasons that, as we used to say, "politics ends at the water's edge" -- that we will criticize our people as seems appropriate to us, but that we'll close ranks and defend our own against outsiders. It's the right thing to do ethically and pragmatically, for one; and it establishes rules of polite conduct, which others hold us to in other countries, and which we have every right to expect of them in ours. As Robert Heinlein once pointed out, morality is exemplified by a mother cat who dies to protect her kittens. The lives of her children are more important to her than her own life; or, to put it another way, the survival of her family is more important than her own personal survival. That's what moral behavior boils down to, at its most basic -- helping to ensure the survival of something bigger than yourself. 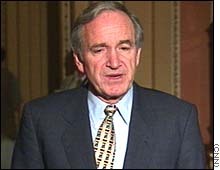 Besides, as Sen. Harkin seems to have forgotten, showing loyalty to your own country -- and treating it as more important than "understanding" some other country -- is helpful in winning elections. And the devil came here yesterday. Yesterday the devil came here. Right here. And it smells of sulfur still today. No comment necessary... except to say that, by comparison, he makes Ahmadinejad seem almost sane and reasonable, something I didn't think was possible. UPDATE II: Many in the blogosphere have castigated Rep. Pelosi and Rep. Rangel, pointing out that their own standard rhetoric is not all that different from what Chavez said. That's true enough. But I don't care. Certainly, I've given them a hard time myself, when I thought they deserved it. Contrariwise, it is proper for me to praise them when I think their actions are praiseworthy, as I believe these are. That's Howard Dean, the chairman of the Democratic National Committee, former governor of Vermont and former Presidential candidate -- and he's dancing while wearing a Fatah khaffiyeh, the style worn by Yasser Arafat when he was out killing Israelis (and Americans). The political blindness implicit in that photo is well-nigh unbelievable. Follow the link for more speculations on Democrats and Jews. Powerline has more, as does Ed Lasky at The American Thinker. It's getting scary out there.